Hello...it's Patti and I want to share a mini album with you that I recently made. Can you believe that summer here in the States is almost over! I'm sad to see it go, but I'm so looking forward to Autumn and all it brings....leaves changing, picking pumpkins, enjoying the cool weather outdoors and of course, Thanksgiving. And Bo Bunny's Forever Fall collection has inspired me to get a head start on a gratitude mini that I've had in mind for awhile. Life gets hectic around this time of year for our family so now seemed to be the perfect time to create a pre-made mini album that I could then fill with photos and journaling later this fall. I kept it simple with the option to add more embellishment once my photos and journaling were complete. Stickers: Cardstock Gratitude Stickers/Forever Fall; 12” Combo Stickers/Forever Fall; 12” Combo Stickers/Etc. I started by making my "cover" from one of the 4 framed shapes on the Cut-Out paper in this collection. I trimmed around it, then folded it in half and trimmed off any excess that showed from either side. I added a bit of adhesive inside and then stitched around the edge. This made the piece sturdy and I liked having a shaped piece for the front page. I added a bit of cardstock to frame my title using alpha stickers from the Etc. collection and completed it with a Trinket, Brad and Chipboard sticker accent. 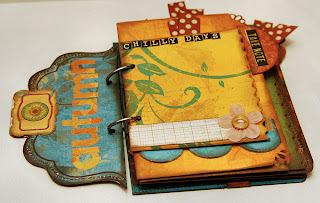 On the back of the front cover, I added a Noteworthy tag, a sunflower sticker and "autumn" using the Combo Sticker alphas. 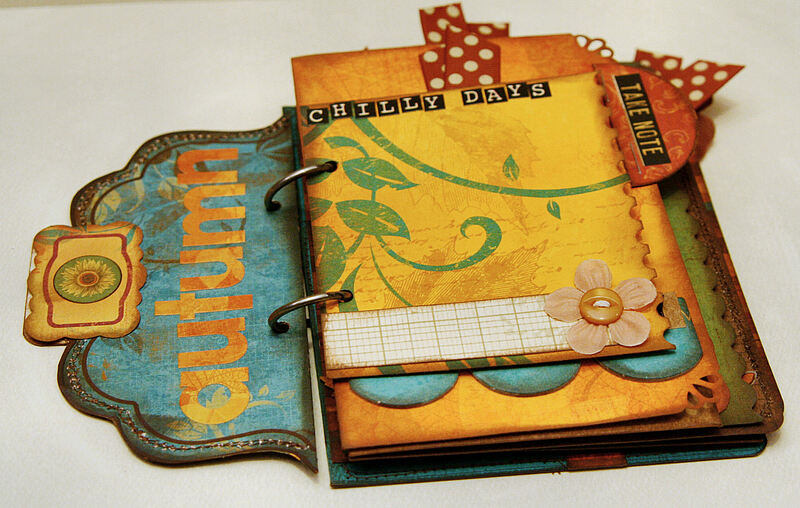 For the "Chilly Days" page, I cut a 4" x 3.5" piece of pattern paper and punched a decorative edge on the right side. 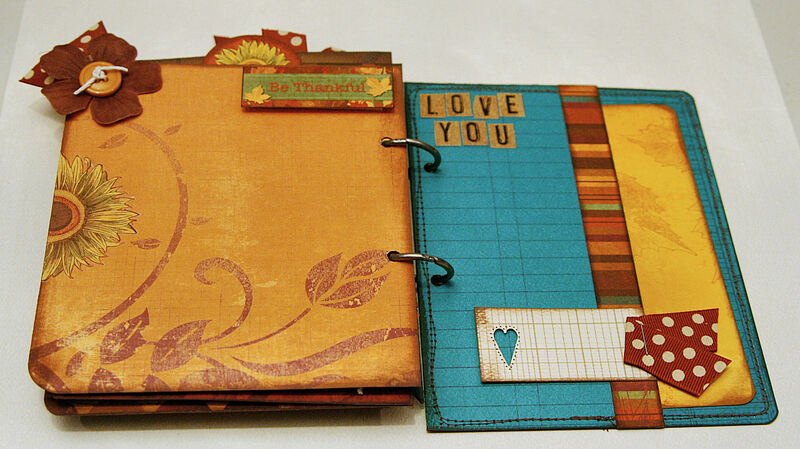 I added a small piece of cardstock and a flower at the bottom, leaving the middle open for a small photo. On the back of the "Chilly Days" page, I adhered a 3" x 4" tag that I'd stapled a bit of ribbon to the top. 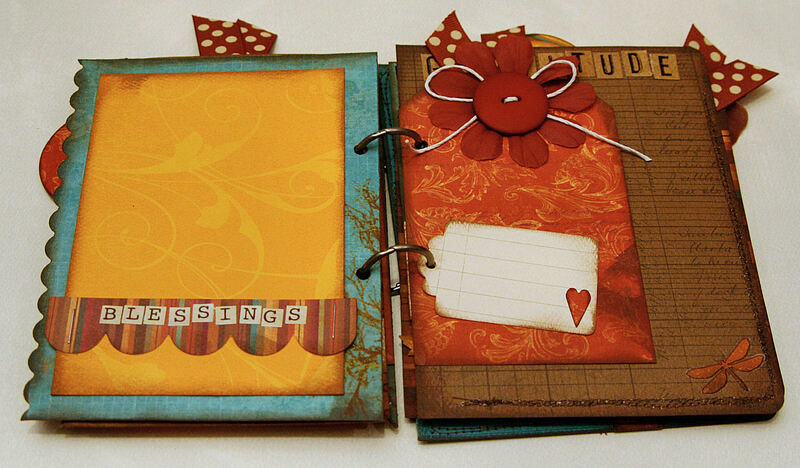 I cut the next page to 5 3/4" x 4" and used a decorative corner punch on the right side corners. I added a scalloped piece of chipboard near the bottom and alpha stickers for "JOY". I made a tab from a circle punch and stapled it to the top right of the page. 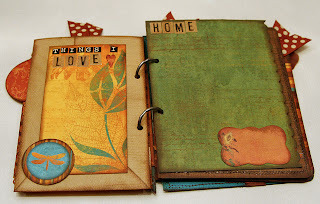 On the back of this page, I added a piece of cardstock as a photo matte and the "together" sticker with adhesive foam. 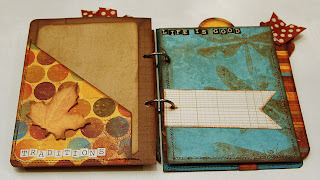 At the bottom, I added a small piece of cardstock to journal on. The next page is a pocket with a tag. The pocket is 5 3/4" x 3 3/4" and has a tag tucked inside. Photos can be added to the tag or simply tucked into the pocket. Before assembling the pocket, I embellished the front with a die-cut scrap (the negative left over) of pattern paper. I adhered another pattern behind it, rounded the corners and stitched it onto the front. On the back of the pocket, I adhered a piece of pattern paper and accented it with alpha stickers and a punched dragonfly from the Cut-Outs paper. This will be a great place to list some favorite things about the season. The opposite page is 5 3/4" x 4 1/4" and has a scallop edge on the right side. I kept this simple and left plenty of space for a larger photo. 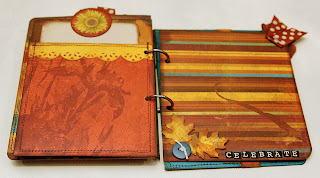 On the back of this page, I cut a slightly smaller piece of Orange Citrus Flourish Cardstock and stapled a piece of scallop trim from the Noteworthy package (on the ends only), then adhered it to the page. The small tag with the heart is loose and turns as a tiny page. It's a great spot for a quote or to record a special memory. The larger tag (4 1/2" x 3") behind it has a flower and button a the top. 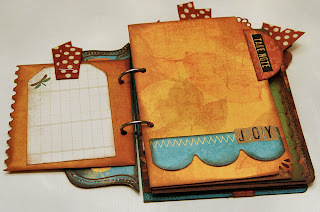 The light colored back of the tag can easily be used for more journaling. Again the opposing page is bigger - 6" x 4 1/2" and has plenty of room for a larger photo. On the back of the Chocolate Journal Cardstock page I created a pocket by stitching on a piece of paper that covers just the bottom left corner of the page. I have a piece of cardstock tucked inside for now that I can add photos to or journal on as needed. As I did with the small tag previously, I cut a ribbon strip of cardstock and punched just one hole to keep it separate from the larger pages. 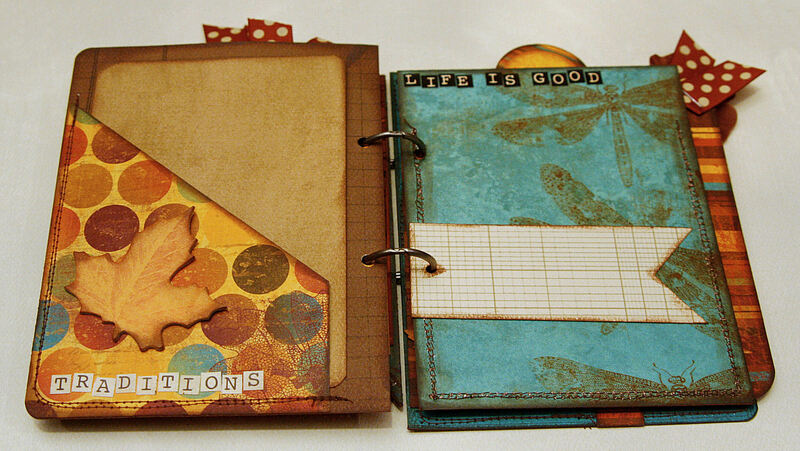 The "Life is Good" page behind it is 5 3/4" x 4 1/4" with a pocket stitched on the back. The pocket on this is simply a piece of pattern paper, border punched at the top and folded down. Then I machine stitched it on to create the pocket. A cardstock tag is tucked inside. 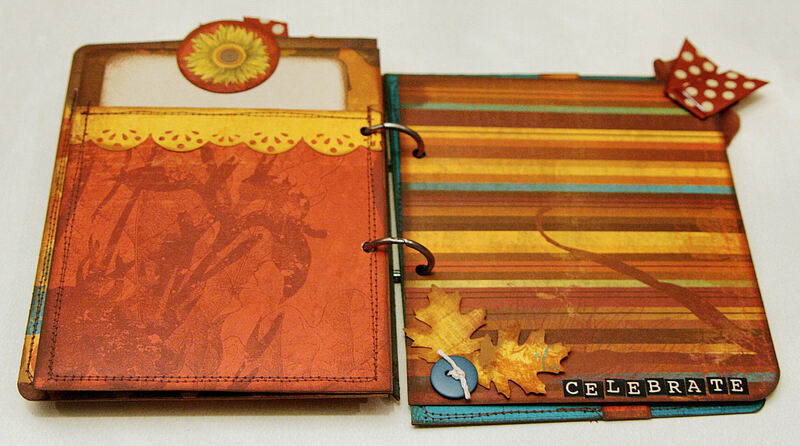 The "celebrate" page is 5 1/2" x 4 3/4" with rounded corners on the right. Punched leaves and a button accent the bottom and a stapled piece of ribbon is at the top right. 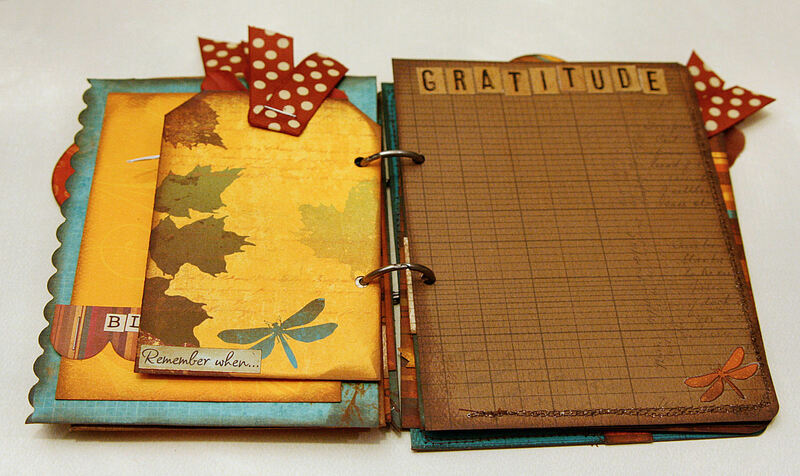 The back is also left open with just a few accents at the top of the page - "Be Thankful" sticker and a flower with a button center. 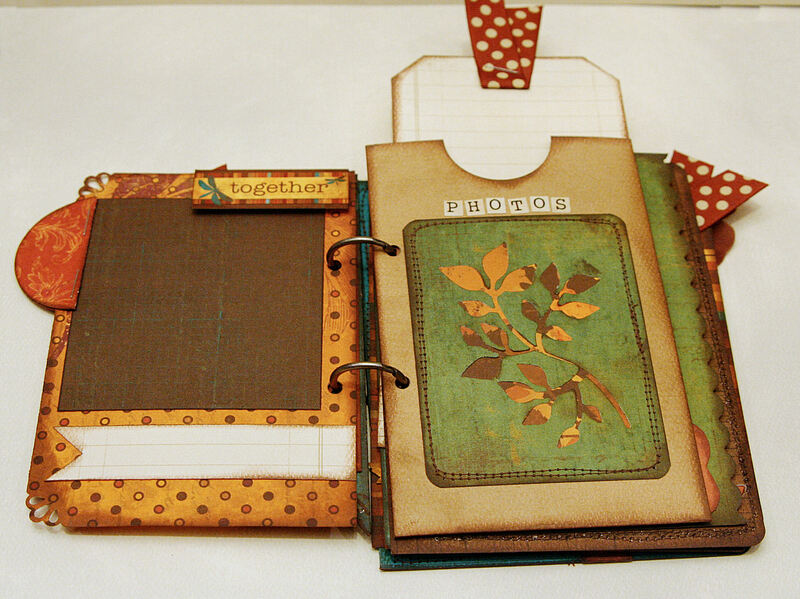 The final page is a cardstock pocket that lets you tuck in a larger photo from the side. I've cut a piece of pattern paper to fit inside to matte my photo(s) when I'm ready. To create this pocket, I folded the cardstock and machine stitched it all the way around. And that's it! I love that the mini album is ready to be filled. And since there's no particular order to the pages, it's easy enough to switch them around or even add more as needed. 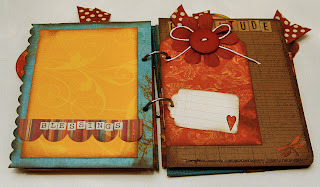 Tip: Once I cut and prepped the basic pages, I punched the holes for the binding rings. They are about 2" apart from the center of each page. Congratulations to the following lucky winners! July 18th - Winner: Janet Lebeau and her Liberty card with the fun pinwheels! July 30th - Winner: Lorena and her "Beautiful Time Flies" birthday card! Beautiful mini Patti! Congrats to the winners! Your mini album is amazing! I love it! And congrats to the winners, however belated I am sure they are thrilled! WOW!!!!!!!!!!! I am a winner! Woohooo! Thank you so much!!!! this is beautiful. I would be interested to know what you used as the album itself (what the paper was adhered to!). thanks.